Frankensteinia: The Frankenstein Blog: I Fought With Frankenstein! …And Frankenstein reacted like a sissy! 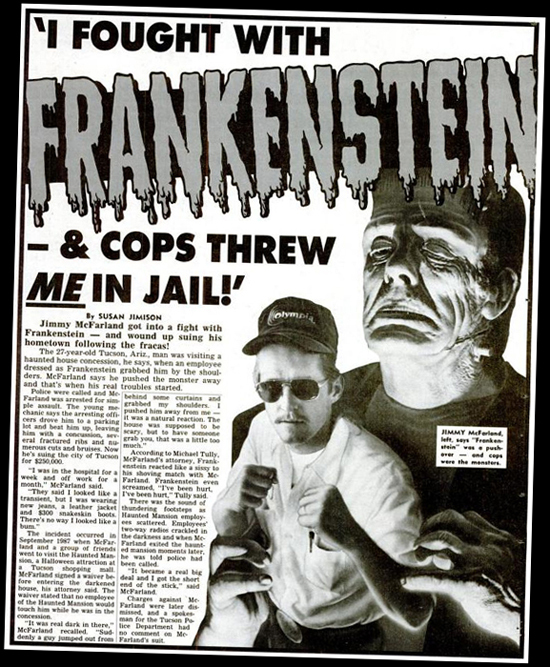 So said one Jimmy McFarlane, posing with dukes up against a looming Glenn Strange, of his unfortunate Halloween encounter with a Haunted Mansion Frankenstein at a Tucson shopping mall in 1987. In a story published in 1989, McFarlane said he was startled when the costumed employee jumped out and grabbed him. Shoving ensued, cops were called. McFarlane claimed he was beaten up and injured by the arresting officers, for which he sued the city to the tune of $250,000. The story is plausible and probably one of those rare “strange but true” stories appearing in the otherwise whacky pages of the Weekly World News, the supermarket tabloid that specialized in Elvis and Bigfoot sightings, UFO activity, dopey diets, impending Armageddon, weird conspiracies and eyewitness reports from outer space and the very circles of Hell. Weekly World News introduced its readers the now famous pointy-eared mutant baby called Bat Boy, and a stone-faced grey alien named P’lod who took photo ops with Presidents and entertained affairs with Hillary Clinton and Condoleeza Rice. Weekly World News folded its print edition in 2007, after a wild 28-year run. It continues today as an online publication.